A simple widget that lets you feature any page or post. Feature Me CTA Widget is a simple widget that allows you to turn any page or post on your website into a call to action (cta).It pulls the pages and posts from the WordPress database and allows a user to choose one to display an excerpt and featured image in a widget area. Use this widget to feature prominent articles, or promote actions on the website. Feature Me is easy to use. If your theme uses widgets, you can use Feature Me. Just select the page you want to display, set a couple preferences and save. Done. Forget about sticky’s. With Feature Me, you won’t waste your time swapping out sticky posts to display your pages. And, because I’ve done the hard work, you’ll never have to hard-code your features again. Feature Me is a widget that can interact with your WordPress theme. Once you’ve activated the plugin, you will find and be able to use it in the Appearance > Widgets section of the website. Feature Me pulls the posts and pages on your website and allows you to select one to feature in a widget area. There are several options that you can modify for your featured post/page within the Feature Me plugin. Choose a page or post to feature on your website. Heading Title – Choose whether to use the posts’s title, hide the title, or use a title of your own to display in the widget area. Body Copy – Choose whether to use the post’s excerpt, hide the body copy, or enter in body copy of your own. Featured Image – Choose to use a featured image (if it exists on the post) or not. 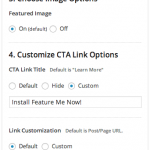 Link Customization – Choosing “Default” will make all links to to the featured page. Choose “Custom” to enter the URL of another post/page on your website or of any other website (ie. for advertising) to direct users to that page instead. This can be useful if you have created a call to action (CTA) post that directs users to a landing page. Custom CSS Class – Add in any number of css classes to modify the appearance of Feature Me with your own styles. Specify CSS classes without the dot “.” and separate classes with spaces. You can install Feature Me from within WordPress (just search for “Feature Me”). You can also go to the Feature Me plugin page and download the plugin from there. Hi Ian, Downloaded your plug-in earlier today and at first it worked like a charm and when I continued to build the site the theme builder (ultimatum theme) wouldn’t let me insert rows or images so needed to remove it 🙁 Any chance you can let me know if there is any coding I can enter on my end to solve the problem. It’s such an easier thing to work with. Hi Ryan, thanks for checking in! Let me know if version 2.0b solves your issues. If not could you send me any errors you are seeing from the plugin?